If you guys have followed me for any amount of time then you know that I have a deep love for French Bulldogs. When I first met my husband, almost 9 years ago, he had two French Bulldogs, Daisy & Lucky. They were both from SD Bullies, a local Southern California Breeder specializing in the Bully Breeds. I had never had a dog before and there I was falling in love with TWO! They were awesome companions full of so much love... and gas! If you don't know by now, Frenchies are infamous for farting! Sadly, Daisy passed away several years ago and Lucky met her on the rainbow bridge in September 2016. I wasn't sure if I would ever be able to love another dog after Lucky's sudden passing. My heart was broken like it had never been broken before. I'm crying now, just thinking about him. He was my shadow, my sound machine when I couldn't sleep, my comfort when I was sick, my best friend, my family. Anytime my husband would mention getting another dog I would break into tears and not just any tears, I would full on sob! I think that if I didn't have my 1-year-old son I might have waited longer to get another dog but it is important to me that he grows up with a dog so I gave my husband the green light, so to speak, to bring another dog into our home. My husband was adamant that our next dog be the same breed and from the same breeder as our two previous dogs. We love the French Bulldog breed and we had a great experience with SD Bullies. We chose to get our new Frenchie puppy from SD Bullies for many reasons but mainly because our two previous French Bulldogs were from them and they were both amazing pets with great health and temperament. Also, it has been pretty cool to see SD Bullies grow and gain such notoriety since the first French Bulldog my husband got from them approximately 13 years ago. Sd Bullies is a family owned and operated business with celebrity clients such as Wiz Khalifa, Snoop Dogg, Usher, Professional Athletes and top models. Some of their dogs even had a photoshoot with Kate Upton for Harper's Bazaar. I know getting a dog from a breeder can be viewed a bit negatively by some but it was the right choice for our family. Our 1 year old son is already bonding so well with our tiny Frenchie puppy and the puppy is so mellow, tolerant and smart. We are madly in love with him! Please watch the below video if you wuold like to see us meet our cute little French Bulldog puppy for the first time at his original home in San Diego with SD Bullies. Our tiny French Bulldog puppy was 8 weeks old and so cuddly and cute! We named our Frenchie puppy 'Lincoln the Lilac Frenchie' because his dad's name is Mr. President and the color of Lincoln's coat, while often mistaken for blue french bulldogs, is actually a rare light grey color referred to as Lilac. Hence, Lincoln the Lilac Frenchie. The above picture kills me! It is as if my baby boy is in as much disbelief as his mama. How is it even possible that my sweet 8lb 15oz bundle of joy is turning ONE today? I feel like I was still pregnant just days ago. This, without exaggeration, has been the fastest, most rewarding and joyous year of my life! It seemed appropriate that I take pictures to commemorate my sweet little baby boy turning into a courageous and curious one year old. I thought long and hard about my son's cake smash photoshoot. I probably began imagining how he would look covered in icing and cake long before he approached his first birthday. (OK, OK, I thought about it while I was still pregnant. Don't judge me!) The closer we got to his birthday though, the further my imagination drifted from the traditional cake smash photos. 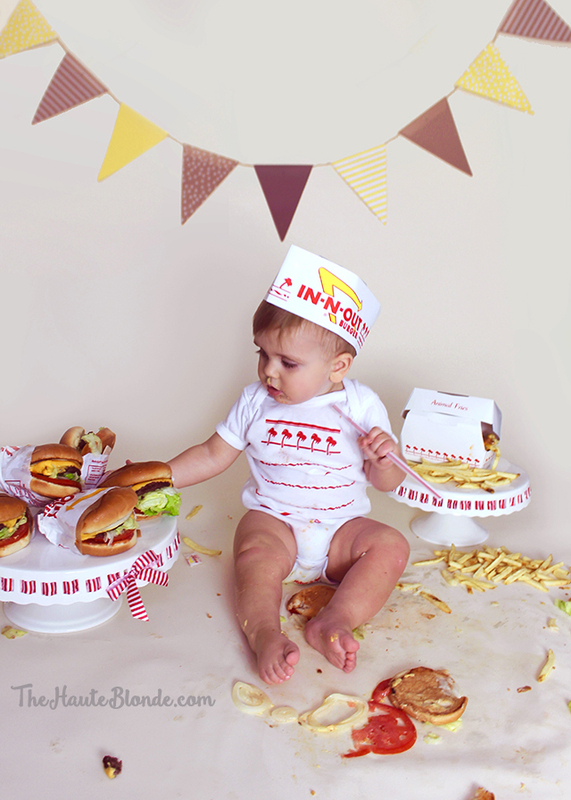 I totally want my little one to have some cake while we sing him the birthday song but since I'm sure we will have plenty of those kinds of pictures from his birthday party I wanted something completely different and unique for his commemorative first birthday photoshoot. The idea for a burger smash came to me after I saw the adorable taco smash photoshoot that went viral earlier this year. Tacos are one of my favorite foods so those pictures totally resonated with me. 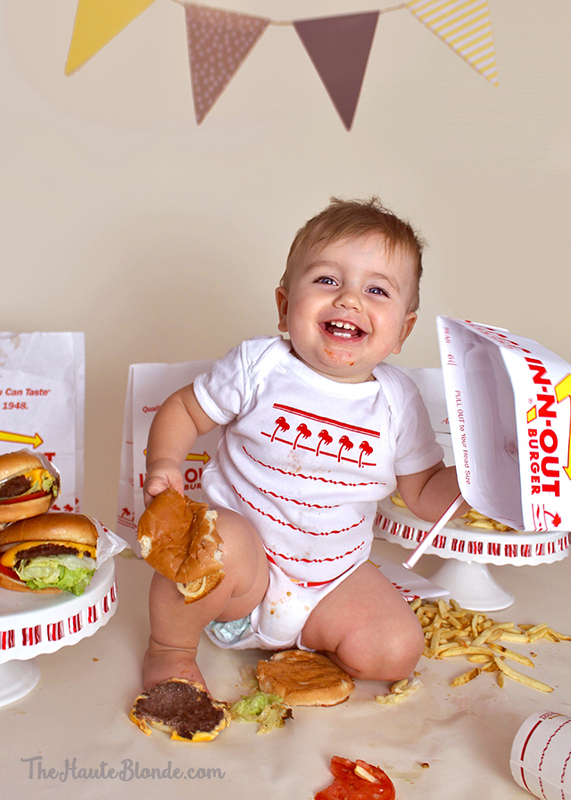 I wanted to eat up that adorable baby and those delicious tacos! However, Griffin is not a big fan of Mexican food. (Crazy, right?!) You know what he is obsessed with though? 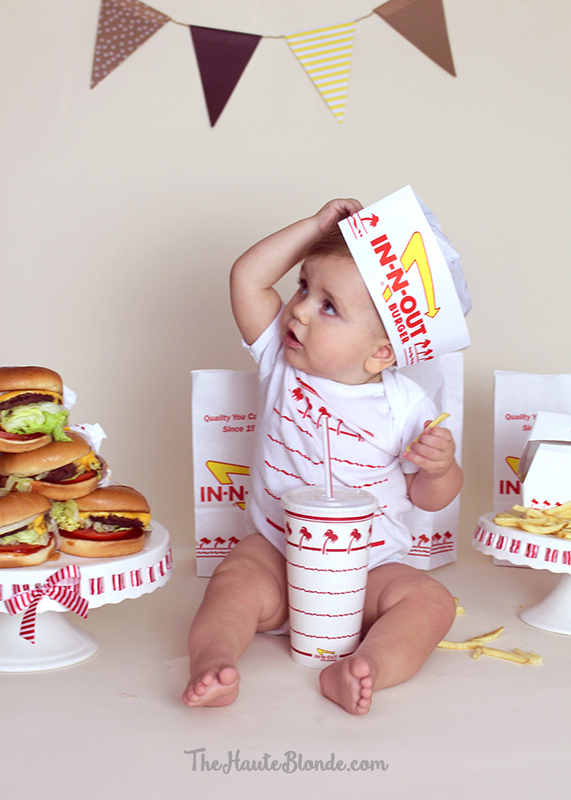 Yep, In N Out Burgers! 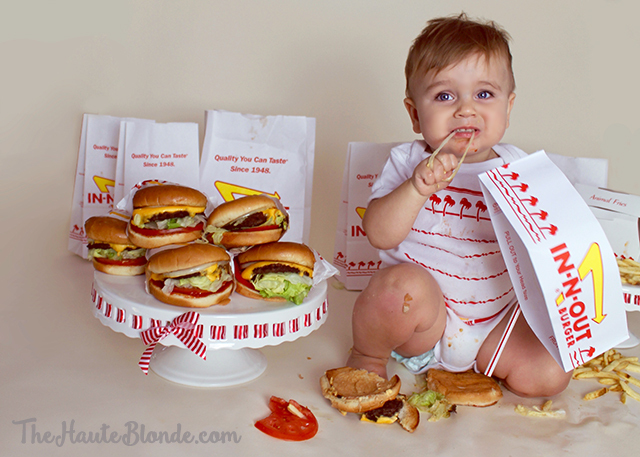 In N Out is a staple in our household and baby Griffin goes crazy for their cheeseburgers and fries! 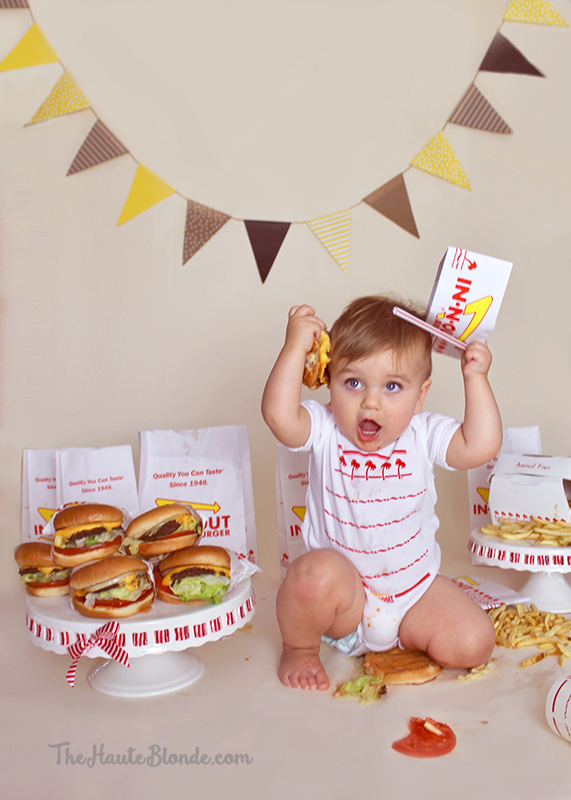 I knew that stuffing his face with his favorite food would make for some seriously cute first birthday smash photos! I hope you guys agree. 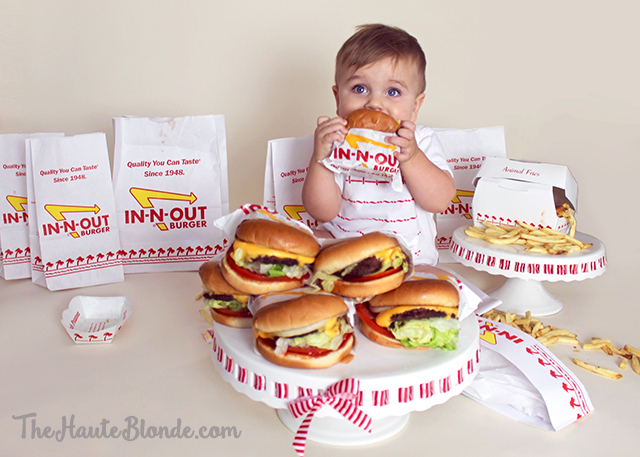 Thank you for stopping by my blog and taking a look at Baby Griffin's First Birthday In-N-Out Burger Smash photos! 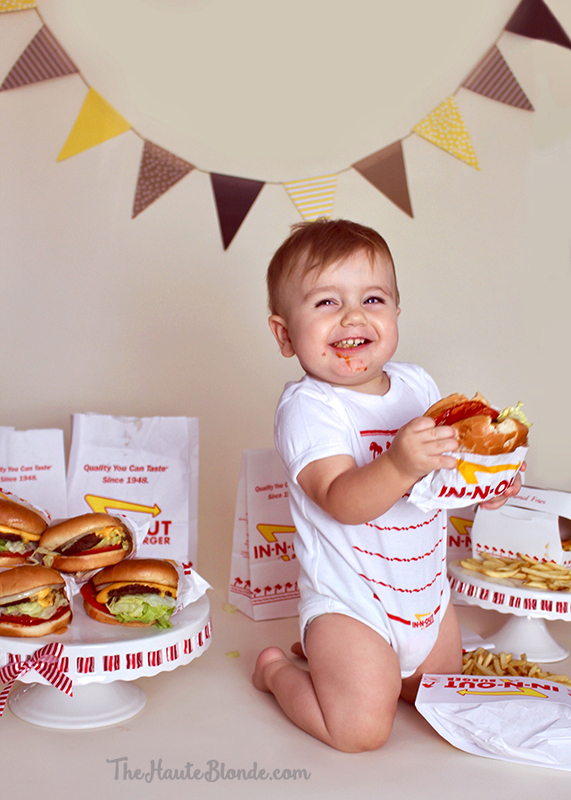 I hope they brought you as much joy as we had getting messy with cheeseburgers and fries. 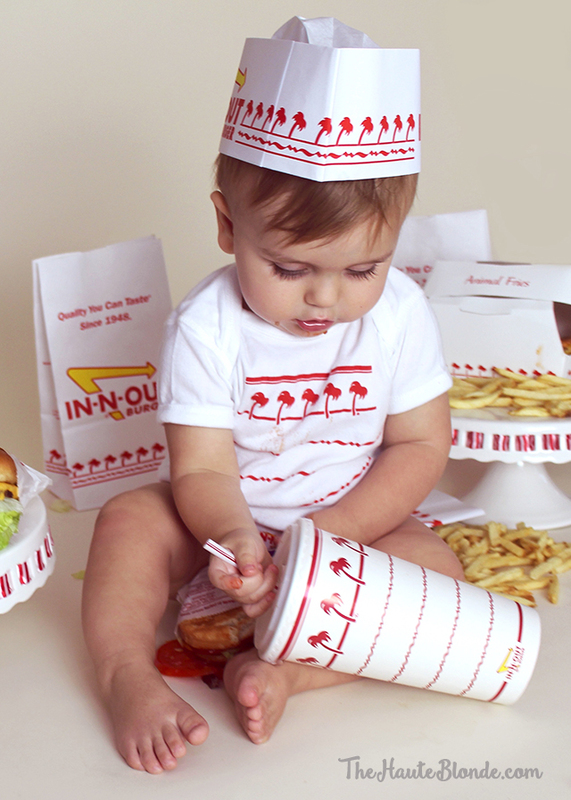 You can order the ridiculously cute In-N-Out drink cup onesie here. The white cake stands are from Home Goods. I added matching red and white striped ribbon from Michael's to them.